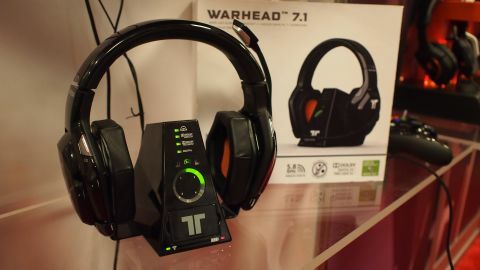 Does Tritton's Warhead pack enough punch to be the definitive high-end Xbox 360 headset? With its sleek design, 5.8GHz frequency and exclusive Xbox 360 compatibility, the Tritton Warhead 7.1 Wireless Surround Headset is for a gamer who wants a wireless audio solution he'll rarely need to think about. If you want to be rocked by airstrikes, trash talk opponents or just hear the footsteps of an enemy sneaking up for a melee kill, nothing can boost your online gaming experience like a quality headset. Designed exclusively for the Xbox 360, the Tritton Warhead 7.1 Wireless Surround Headset has stereo sound that brings the battlefield into the living room. It's also the only way to get "truly" wireless chat on the 360, no Bluetooth dongle required. Tritton's parent company Mad Catz won the exclusive rights to develop a headset for the 360 that's free from a mic cord tethering it to a controller or Bluetooth receiver. The Warhead headset is truly wireless, easy to sync, and ships with a combination docking station and battery charger that makes this stylish set of surround sound cans into a complete audio package. There are also two high-capacity batteries to swap between, so you'll never be without a charge when the flak starts flying. The Warhead's stellar interface and luxurious extras all seem to be "buttering" the consumer up in preparation for the stiff asking price of $300. It's among the heftiest price tags on the market, but is the Warhead immersive enough to be the go-to headset of Xbox gamers looking to really spoil themselves? We're glad you asked! With its sleek dark finish, the Warhead was surely designed with the matte black look of the Xbox 360 S in mind. The interior of the earphones is Tritton's signature bright orange, which makes for an eye catching combination. Compared with other surround sound headsets, the Warhead is none too heavy. Its ear pieces are padded with imitation leather, and are designed to pivot slightly for a more comfortable fit. The headset's adjustable sizing is marked with numbered increments, so as to keep the size right where you like it. The buttons on the headset are laid out practically, with the power and sync buttons hidden on the interior of the earpieces so users won't accidentally bump them. More frequently used switches like game and mic volume are placed on the left and right earpieces, which makes them easy to keep separate. There's also a big button for cycling through equalizer modes. The Warhead's microphone is removable, you just snap it into the left earphone. It has its own on and off switch, so it's simple to mute yourself when you want to say something your team doesn't need to hear. There's even a red light to tell you when you're muted. The mic can rotate a full 360 degrees, making it easy to move out of the way when not in use, or you can just pull it right off to give your team the silent treatment.